We all want a healthy and thick head of hair, but unfortunately, many of us are struggling with the problem of hair loss. There are many reasons for hair loss, like aging, environmental effects, excessive smoking, too much stress, hormonal imbalance, nutritional deficiencies, certain medicines, scalp infections, use of chemically enriched or wrong hair products, and medical conditions like autoimmune disorders, thyroid disorder, iron-deficiency anemia, polycystic ovary syndrome (PCOS), and chronic illnesses. Our scalp has about 100,000 strands of hair, so losing 50 to 100 strands per day is normal. However, anything above that may progress to bald spots or baldness. That’s why you need to take some actions, and for that, you can use certain natural ingredients. We present you 10 home remedies that will help prevent and reduce hair loss. In order to reduce your hair loss, start with massaging your scalp with proper hair oil. This will improve the blood flow to the hair follicles and your scalp’s condition and will strengthen the roots of your hair. These massages will help you relax and reduce your stress. Proper hair oils to use for these massages are almond oil, coconut oil, amla oil, castor oil, olive oil, argan oil, emu oil, and wheat germ oil. For better and faster results, add several drops of rosemary oil to the base oil. Massage your scalp and hair with some of these oils by applying light pressure with your fingertips. Repeat this once a week. Deficiency of vitamin C can cause hair loss. Indian gooseberry, also called amla, is loaded with this vitamin which is why it ensures fast hair growth. What’s more, Indian gooseberry has antioxidant, anti-inflammatory, exfoliating, and antibacterial properties which encourage hair growth and a healthy scalp. Combine a tablespoon of lemon juice and another one of amla pulp. Apply the mixture and massage all over your scalp. Once you finish with the massage, cover your hair with a shower cap. Let it stay overnight. Shampoo your hair the next morning. Another effective remedy for hair loss is fenugreek or methi. The hormone antecedents in fenugreek seeds promote hair growth and help restore hair follicles. The nicotinic acid and proteins in their content further enhance hair growth. Soak one cup of fenugreek seeds in water overnight. Pour water over a cup of fenugreek seeds, and let them soak overnight. Grind the soaked seeds in the morning to make a paste. Apply the paste all over your hair and cover it with a shower cap. Let it stay for about 40 minutes, and then wash it off. Repeat this every morning, for a period of one month. The high amounts of sulfur in onion juice, help enhance the blood flow to hair follicles, reduce inflammation, and regenerate hair follicles. Moreover, onion juice provides antibacterial effects that destroy parasites and germs and help in the treatment of scalp infections which are possible reasons for hair loss. The Journal of Dermatology has published a study in 2002, where nearly 75% of the participants who treated their hair loss with onion juice has noticed significant hair regrowth. Grate one onion to extract the juice from it and then strain it. Apply the onion juice on your scalp and allow it to stay for about half an hour. Rinse it off and shampoo your hair. Another option is to combine 2 tablespoons of aloe vera gel and 3 tablespoons of onion juice. If you like you can add a tablespoon of olive oil as well. Apply the obtained mixture all over your scalp and allow it to stay for at least half an hour before washing it off and shampooing your hair. Choose one of these remedies, and use it 2 or 3 times a week, for a period of a few weeks. The enzymes included in aloe vera directly stimulate hair growth. Moreover, it possesses alkalizing properties which will improve the pH of both scalp, and hair, which in turn encourages hair growth. If you use this remedy on a regular basis, you can also reduce the scalp inflammation and redness, scalp itching, alleviate dandruff, and add luster and strength to your hair. Both, the juice and gel from aloe vera work. Apply one of them onto your scalp and let it stay for a couple of hours before rinsing it off with warm water. Do this treatment 3-4 times a week. Another option is to consume a tablespoon of aloe vera juice first thing in the morning. The flower of Chinese hibiscus possesses natural properties that are extremely beneficial in the treatment of hair loss. Not only that it stimulates hair growth, but you can also use it to prevent split ends and premature graying, to cure dandruff, and to thicken your hair. To prepare the hair loss remedy from Chinese hibiscus flower, you need 2 cups of coconut oil and 10 of these flowers. Add the flowers in the oil, and heat until the solution is charred. Strain it to get the oil and use it to apply on your head before bedtime. The next morning, wash your hair thoroughly. Do this treatment several times a week. Another option is to prepare a tea from Chinese hibiscus flower and to rinse your hair with it for a proper hair growth. This herb prevents hair damage and hair loss. Licorice root possesses mollifying properties which open the pores, soothe the scalp and help in treating dry flakes or other irritations. 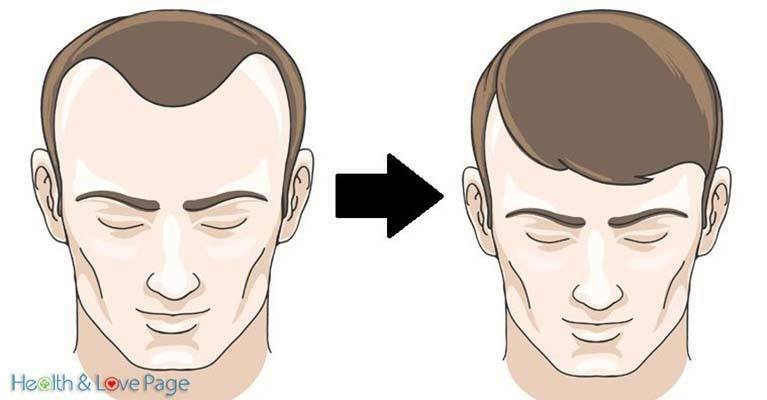 You can use this remedy for hair loss, dandruff, and baldness. In a cup of milk, add a tablespoon of ground licorice root and ¼ teaspoon saffron. Mix well to make a paste. Apply it on your bald patches before going to bed, and allow it to stay overnight. The next morning, rinse your hair. Do this treatment once or twice per week. Another alternative is to drink licorice tea 3 times daily. Beetroot juice includes many nutrients which are crucial for healthy hair growth. Some of them are protein, calcium, carbohydrates, phosphorus, potassium, and vitamins B and C. Besides consuming fresh beetroot juice, you can also include carrot juice, alfalfa juice, or spinach juice to maintain a healthy hair. Another option is to make a paste by grinding several boiled beetroot leaves and mixing them with henna. Apply the mixture on your scalp and let it stay for 15-20 minutes before you wash it off. Do this few times a week. Omega-3 fatty acids stimulate hair growth and prevent further hair loss. Luckily, flaxseeds are loaded with them, and you can use them to prepare a home remedy for hair loss. Every morning, consume a tablespoon of freshly ground flaxseed together with a glass of water. Another option is to add them to your smoothies, soups, salads, and other dishes. You can as well apply flaxseed oil on your hair to strengthen your hair and prevent hair loss. Thanks to the abundance of essential fats and proteins in coconut milk, you can use it to prevent hair loss and to stimulate quick hair growth. To make a homemade coconut milk, you need a pan of water and a freshly grated coconut. Let it simmer for about 5 minutes and strain it. Allow the milk to cool, and apply it all over your scalp and hair. Let it act for 20 minutes and then wash it off and shampoo your hair. To increase the effectiveness of this remedy, add powdered fenugreek seeds and black pepper to the coconut milk prior to applying it. These natural remedies will help you deal with your hair loss. But don’t forget to have a proper diet with many fresh fruits and green vegetables, to protect your healthy hair.